Paul H. Belz's epic historical antebellum romantic-adventure novel chronicling America's industrial and social coming-of-age. The novel follows five characters, all of whom demonstrate life's reality that you can have joy or power but not both. Enjoy the free sample chapters below and purchase at the Amazon Kindle store. An energized crowd is assembling at the stag restaurant’s front window inside the rail terminal at Pavlovsk, just south of Tsarskoe Selo. Two sets of silver duga bells are audible across the silent winter landscape for over a mile, and Tom Winans’ coachman Wassily is confident their troika is in front. Scrambling outside to applaud his employer and blanket the horses is Maksim, and not until half a minute passes do three black stallions emerge from the woods with Tom standing in his sleigh like a defeated Roman charioteer. “Now I know how Catherine the Second felt,” says Tom, as he congratulates his brother. “Except you had the benefit of Orlovs,” Bill replies, alluding to the Russian legend that Catherine’s fancy European horses tired, stalling her coach as she dashed along this same road from Tsarskoe Selo to St. Petersburg to orchestrate a coup d’etat against her husband Peter III. Her trusted lieutenants, the Orlov brothers, quickly obtained new horses for her, and, after surviving the coup, resolved to develop a more durable breed. Orlov trotters are tall and powerful, with great endurance, good speed, and attractive Arabian-influenced faces. There is no winter sport eliciting more passion in Russia’s capital than troika racing. It’s a romantic, breathtaking spectacle that lures thousands to the Neva River ice in front of the Peter & Paul Fortress, where an ellipse is cleared of snow for the traditional three-verst races. An Orlov team can easily cover thirty versts (about twenty miles) over snow in an hour and ten minutes, if serving a traveler rather than a sportsman. Troika drivers are the most skilled coachmen in Russia. Three powerful horses must be trained to move in delicate harmony with the center or duga horse trotting rapidly, while the outside horses canter or gallop with their heads bent outward. The driver must handle four reins, two for the duga horse—the biggest of the three—and one-each for the outside stallions. 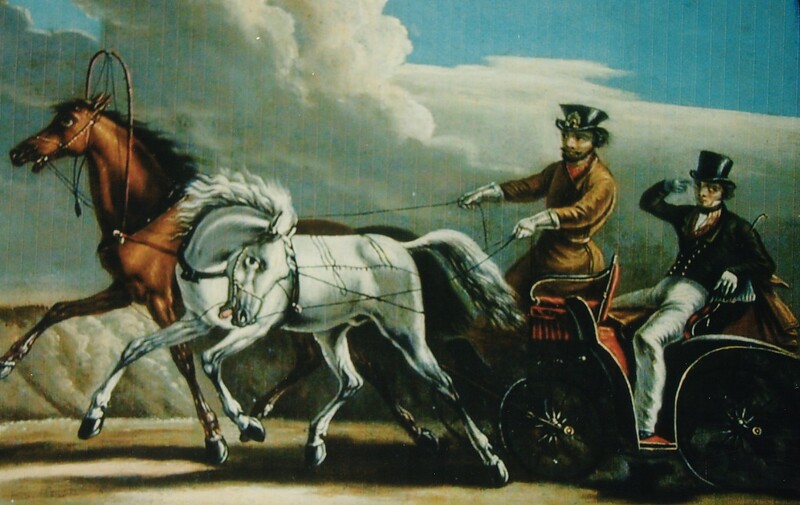 An elaborate harnessing mechanism connects the horses to each other and the sleigh, which is converted to a wheeled-carriage in summer. In racing venues, the duga horse is not allowed to break from its trot and great strength is required of the driver to hold back such powerful animals. Beards and peacock-feathered hats are de rigueur for the colorful coachmen. Troikas are equipped with untuned brass bells for the average owner, while the wealthy have tuned silver bells to announce their arrivals. In addition, these often ornately decorated symbols of Russian culture have a few practical attachments such as nets to catch the hoof-driven snow, which would otherwise pelt the driver. Bill and Tom are happy to leave the thirteen degree air and shed their long, furry shubas, sealskin caps, and fur boots for the warm indoors. They plan to bathe, then lunch on a ritualistic post-race meal of fish soup, beef cutlets, cauliflower, pastry, and coffee before retiring to the billiard room for cigars, vodka, and a discussion of the future. The Pavlovsk terminal serving Tsarskoe Selo nestles in a pine grove containing a number of Western-style buildings including a ballroom, concert hall, billiard rooms, fountains, restaurants, and rooms for travelers. Tsarskoe Selo (Czar’s Village) was originally a Finnish farm. In 1708, Peter the Great acquired the land twenty-five kilometers south of St. Petersburg for the residence of his wife Empress Catherine I. It was during Empress Elizabeth’s reign from 1752-56 that an attempt was made to rival the Versailles in France. She built the Emperor Palace—a masterpiece of Russian baroque—as well as the Hermitage, the Grotto Pavilion, and the Upper and Lower Gardens. Finally, during her reign from 1760-1790, Catherine II added the Cold Bath-house, the Agate Pavilion, the Hanging Gardens with its sloping platform, and the Cameron Gallery. The city became Russia’s dazzling jewel. It was in 1835 that the Czech and Austrian nobleman Franz von Gerstner convinced Czar Nicholas I that he needed a railroad to facilitate troop movements and keep pace with England’s technological advancement. Recent conflicts with Persia, Turkey, and Poland made the argument for rapid movement of troops more persuasive. The Czar reflexively sent soldiers to any country where liberalism threatened a monarchy. Against the advice of all his advisers—whose objections were economic—a hesitant Czar allowed the well-known mathematician and engineer to build a small experimental railroad from St. Petersburg to Tsarskoe Selo in 1837. Railroading had passionate opponents everywhere. The Vatican pronounced it sinful to travel at such unnatural speeds; German medical experts predicted people’s heads would explode in tunnels; English farmers feared frightened cows would stop giving milk; Belgians lamented the extinction of the horse; yet the Czar immediately loved his powder-blue imperial train. Gerstner was dispatched to study America’s railroads and canals but died there in 1840, creating the opportunity for someone else to build the historic St. Petersburg to Moscow line, for which the Czar was prepared to spend 34 million rubles. If troika racing is the favorite outdoor sport of the Winanses, indoors it is billiards. When discussing death, Tom pledges to mimic Mary, Queen of Scots, who played billiards in her prison cell and left instructions that her headless body be wrapped and interred in the cloth from her table. Since billiards is your deepest addiction, tell me your fate,” says Bill. “You are a spoiled brat, Tom. Our work-driven father created an opportunity that has made us rich, and our lives will be easier because of his labor. Unless you’re running for president against a vulgar but popular war hero, how can that damage you? Don’t the accomplishments of a man supersede his hobbies? Washington and Lafayette competed at billiards; Jefferson was a devotee in spite of Virginia’s ban; Napoleon had a table on Elba; and I understand even Pius IX put a table in the Vatican last year. So you’re a spoiled brat in good company,” says Bill, as he fails to pocket a targeted ball off a carom. “It won’t matter because my public reason for staying abroad is not a lie. My body couldn’t survive another Atlantic crossing unless Father invents that ship he’s long dreamed of, which slices harmlessly through the waves. But I do believe we will get those contracts. The Czar is going to honor Whistler with the Order of St. Anne of the Second Degree in March, and I doubt that such an honor is a prelude to a contract with the French or English,” says Bill. “Tom, you disappoint me. Just as it wasn’t necessary for Ross Winans to come to Russia, it is similarly unnecessary for Major Whistler to remain. His eldest son is a protégé of Father’s in the Mount Clare shops, and I have matchmakers there fanning the flames between Julia and George. If he marries our sister, we can make him a partner in Russia, keeping the Whistler name in the operation. I have word from a foreman that he is smitten with Julia,” says Bill. “And they will destroy your dreams if you do return to Baltimore, Tom. Father will move next door to your mansion, build a rooftop cupola from which to spy on you, and hound your poor wife to be a duplicate of Mother. You should build railroads in California,” says Bill. “I had hoped for your counsel, not your scorn,” says Tom. “Within my scorn is my counsel. But I’ll reserve any judgment. If your fabled charm and negotiating skills can keep us in Russian contracts, perhaps Father is conquerable for you, but I believe Napoleon gave himself an easier task,” says Bill. Paul is the author of "The American Opus," a novel which was inspired by the author's childhood playing in Leakin Park, Baltimore's urban wilderness which was once "Crimea," the nearly 1,000-acre country estate of railroad industrialist Tom Winans. Seven years of full-time research and writing produced the antebellum historical romance and adventure tale of one of the men who built Russia's first railroad. In a larger sense it is a tale of America's adolescence as social upheaval, industrialization and the Civil War transformed her into a world power.